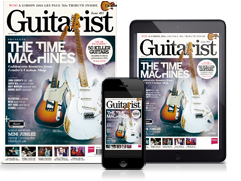 In a recent feature, I discussed how some of the biggest names in guitar playing history have invented their own unique guitar tones - sometimes very much by accident, coincidence or maybe something more. The name Howard Alexander Dumble may not mean much to the man on the street, but the amplifiers this gentleman has produced over the last 50 years have gone on to gain almost biblical status among us tonehounds. I, myself, have been almost obsessed with the Dumble story since the mid-1980s. Here, I present to you the Dumble Overdrive Special - and not just any old Dumble. This is one of a pair that belongs to one of the legends in Dumble’s story, Mr Robben Ford. Both Robben Ford and Alexander Dumble (he dropped the name Howard in favour of his middle name) grew up in the Bakersfield area of California. At this time, the West Coast of the US was an absolute melting pot of music - and musicians who would gather from all over the world. Alexander’s own family was hugely musical and from a very young age his interest in musical instruments and electronic equipment would throw fuel on the fire of his passion for rock ’n’ roll and, most importantly, the electric guitar. Alexander started producing amplifiers in the early to mid-1960s, and by the end of the 70s he had built amps for some of the very biggest names in guitar history, including David Lindley, Jackson Browne, Lowell George of Little Feat and Bonnie Raitt. Later, he would also go on to build amps for Larry Carlton, Stevie Ray Vaughan, Eric Johnson and, most importantly to this feature, Robben Ford. Alexander was, and is, no slouch on the guitar. People who have heard him say that he’s a most accomplished player. This guy actually played in a band called Captain Speed who opened for Jimi Hendrix. He has unwittingly gained absolute legendary status in the guitar world. This is a man with one goal: to make the finest, most responsive guitar amplifiers ever created. He never wanted to be a hugely successful businessman or, heaven forbid, a household name. We must remember that he’s only produced around 300 amplifiers, and yet to this day and for ever more, guitarists will whisper the name “Dumble” in dimly lit backstage areas, or type it into a search bar on an internet forum. His name will go down in tonal history and people will ask, ‘Have you tried one?’ To which most, unfortunately, will say no. While on tour, Robben and I have spent many a happy hour in a van or tour bus discussing guitars, amplifiers and, most notably, Robben’s Dumble amplifiers. His most famous amp is his Tan Dumble (serial number 102) bought from Alexander in around 1983. The pictures here feature Robben’s second amp, one that he bought from Alexander around 1993. To my ears, they are both slightly different. The Tan one has a more pronounced treble response and strong midrange, whereas this black head has an overall warmer tone with a gentle scoop in the midrange. If I could keep one of these amps, it would be this one… but it would cost me in excess of £100,000 and, of course, neither amp is for sale! Did you have any involvement with Alexander Dumble prior to him making an amplifier for you? “I have a vague recollection of meeting him in a small club in Palo Alto, California, when I was playing with my brothers’ band, The Charles Ford Band. Alexander has since told me we definitely met there and he introduced himself to me. When did you first get the chance to actually play through a Dumble amp? “The first time I played through one, having not met him, [it] belonged to a guy called Andy Brauer, who had a little shop on Lankershim Boulevard in North Hollywood, and he rented out gear to musicians. So, Alexander got the idea to build the Overdrive Special from listening to you, but you still didn’t own one yourself? And this was all still way before you’d had your own amp built? That’s amazing. It’s not how I’d have imagined it at all - I’ve always thought you were one of the first owners of those amps. How were those early Dumbles in comparison with what you had been using up until that date? “They had way more clarity, more power. Of course, these were 100-watt amps and I had been using Fenders that were, like, 40 or 50 watts - so a lot more ‘headroom’, I guess you’d call it. I mean, they had the 50-watt switch on there and my own amp has that switch and I quite literally don’t like it. Going back to the early days when you were using the Fender Bassman, were you using any additional boost pedals or overdrive pedals at the time? “Yeah, I know! I cant even believe it myself. I mean, we were young, we didn’t know what we were doing, everything was pure luck. It was pure luck I even had that amplifier. Would you like to know the story of how I acquired that [Bassman] amp? In junior high school I had a terrible little group, four of us. Nobody could really play. I played bass, saxophone and sang. “The other guitar player’s father was head of a savings bank in Ukiah, California, so they were pretty wealthy by our standards. The mother, who had to put up with all our rehearsals, would come into our room and talk to us. One day she decided to take her son down to San Francisco and buy him whatever he wanted for the band. He picked out a Fender Bassman for me and a Bandmaster for himself. If that had been any other amplifier you’d acquired, then, the Overdrive Special may never have been made? You mentioned earlier on about the importance of speakers. Alexander was mainly fitting Electro-Voice (EV) speakers at the time - did you ever use EVs? And too heavy. Leading up to the time of you getting your amplifier, who were you playing with then? “I’d been playing with Joni Mitchell and then George Harrison. I’d been using a Fender Twin fitted with Altec Lansing speakers. I’d saved up some money and was pretty much doing nothing for a year while living in Boulder, Colorado. I started playing with Joni again for a while and moved back to California. This was towards the end of the 70s. I had also landed my record deal, so I decided to buy a Mesa/Boogie. I’d heard Larry Carlton play through one and it sounded really great. However, I did not get on with it. I recorded my first album with everything but the Boogie. “Steve Cropper produced that record [The Inside Story], so I was maybe using a tweed amp of his and an Ampeg. I was even using an early Roland amp. I was just trying everything to find my thing. I was really searching. Tell us about the process of purchasing the Dumble. Did you just order it or did you go to his workshop for a ‘fitting’ of sorts? When you received your new amp, did you bond with it instantly or did it have to be modified in any way? How important do you think that amplifier has been to you over the years - to your sound and to your growth as a player? Have you ever tried any of the amps that are trying to replicate the Dumble sound? If so, what have you thought of them and do they fall short? What is Alexander like to deal with? You get to hear such fabled stories about his eccentric character! The Overdrive Special By Howard Dumble: this 1992/3 amp features the very rare ‘By Howard Dumble’ signature in gold lettering. This was used for a very short time in the early 90s; up until then the inscription read ‘By Dumble’. This amp is currently fitted with JJ 6L6 GCs, but they were originally fitted with Philips 6L6s or Groove Tube 6L6s. Sometimes Mr Dumble even used the highly prized and rare Philips 7581s, which are a hard-to-find, super-high power variant of a 6L6. The two inputs are marked FET and NOR (MAL). FET stands for ‘field effect transistor’ and, broadly speaking, is a solid-state, buffered input. Mr Dumble added this so players could match their lower output guitars to their higher ones, single-coil versus humbuckers, etc. In this instance, the FET input is never used. The rear of the amp features a pair of ‘Signal Access’ sockets; these are effect send and return sockets for use with the Dumblelator device, which enables the player to match external effects units to the amplifier perfectly. Robben rarely uses these now, but he has used the Dumblelator to sync with a TC 2290 Delay unit. If the sockets are not used it seems to sound nicer with a short patch cable inserted. The front panel also offers the player some interesting presets: Bright on and off, Deep on and off, Rock and Jazz. Robben’s playing and attack have plenty of natural brightness, so extra is never needed. The Deep switch can get way too big if used at loud volumes; the Rock and Jazz gives the player the choice of either dead clean (Jazz) or big and dirty (Rock). The Overdrive section of the amp is very sensitive to how the first volume dial is set. When it’s dialled in, the Overdrive can take you from smooth blues to full-on rock. Robben sits between the two, mostly. Robben’s touring pedalboard features the Hermida Audio Zendrive, itself often regarded as having Dumble-esque overdrive voicing, here with Volume and Gain set just below 12 o’clock and the Voice control at about 1pm.